Buffalo Bob’s makes a shitload of unique game meat and exotic meat jerky sticks. Some are long, round and dowel-shaped, like Slim Jim, while others are long, flat and rectangular strips. Most of the exotic and game meats also have beef mixed in with the other proteins, so the variety isn’t really as diverse as it seems on first glance. 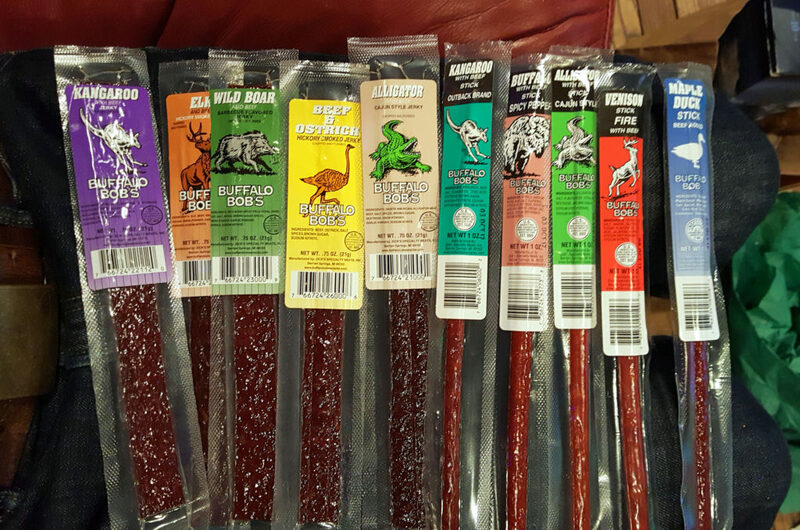 I received this set as part of a Christmas gift, and it included two of each flavor (one flat and one round each): kangaroo, elk, wild boar, ostrich, gator, buffalo, venison and duck. The texture and flavor is better than something like Slim Jim (less waxy and oily, and easier to bite and chew), but not quite on par with the more artisan jerky brands I’ve reviewed in the past. These are good for on-the-go, single serving bang-outs, whereas the bags are meant to last a few snack sessions. Also there is a vast price difference. Some of those jerky bags can run you about $8 a pop. These are more affordable.